By default, the Momotor tab is hidden. To make it visible, click the drop-down arrow at the end of the Momotor tab and click enable or drag the Momotor tab to the top section. 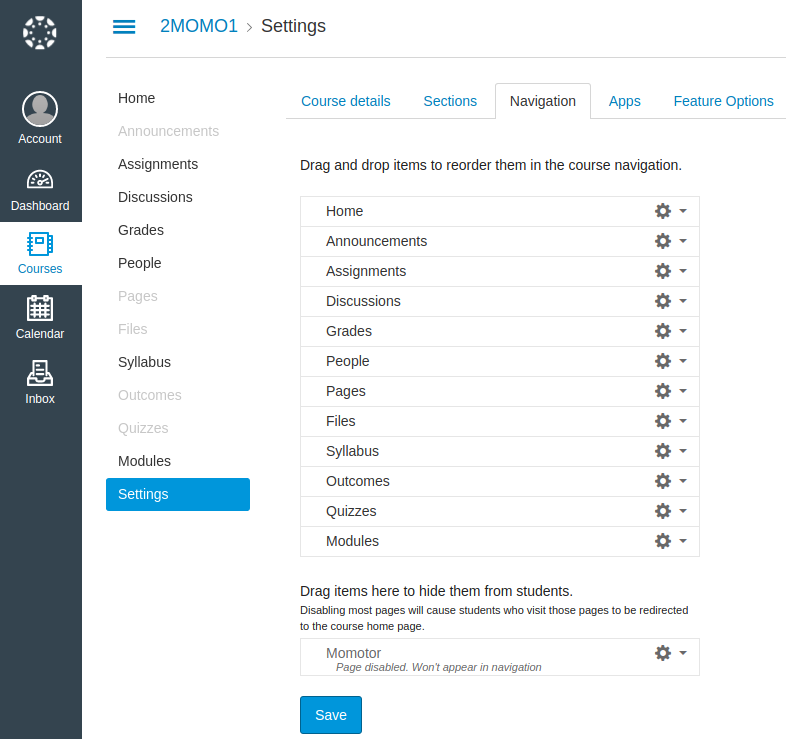 The Momotor tab can be positioned anywhere in the navigator, but since Momotor is related to the assignments, we advise to put it directly beneath the Assignments tab. Save the changes to the navigator. The Momotor section should now be available in the navigator. The app can be removed from the navigation by moving the Momotor tab in the course navigator to the hidden section. This will only remove the app from the navigator making it impossible to access, but existing configuration and results will not be deleted and processing of submissions for configured assignments will remain active. In order to process the assignments, the app needs access to the course data in Canvas. The first time you select the Momotor tab in the navigator to open the app, it will ask for authorisation to access your Canvas account. Click Authorise to continue. Students will need to authorise the app as well when they want to review the results of their submissions in Momotor. However, for the processing of submissions only the teacher’s access is needed. Student submissions will be processed even if they have not authorised the app. Without a teacher’s access to Canvas, the app will not be able to function. If however you want to revoke the app’s authorisation, you can do so from your Canvas profile settings. Momotor will be listed as an approved integration. To remove the authorisation, click the trash can icon after the app name.